Awesome! How difficult was it to do? What kind of gear do you guys have? How was the scripting of the dungeon? Anything not working? I'm really curious about if everything is working as it should. 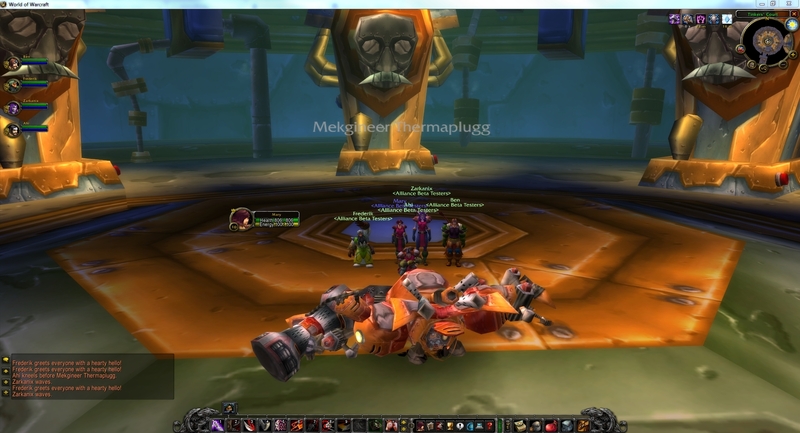 The difficult where good, we were lucky that we had a Prot Paladin as taank becuase of all the mob groups. Ben is ridiculusly geared so i think you will have to fix the gear a bit. With his new Libiran and Seal of Commander he solo guards and stuff so he dose a ton of damage. I my self don't really do tha much of Damage even tho i got pretty good gear but far from BIS. It worked pretty well with 2 Paladins 1 Rogue and Healers but it is hard to say if the dungeon is even balanced becuase of our bugged gear and stuff. We have to try it again when the gear is nerfed to your likeing. The scrip on the last boss was actully really well maybe i think the bombs did damage and we had to press the buttoms to stop them and the boss was throwing us not that much that i would like. So if i would have thrown us more it wouldt been a tank and spank I think. But over all the server is great and it is getting better and better. I have not seen any big bugs or so that is gamebreaking exept our gear. So if you want to balance the server i think you need to get a Standard gear set and show us what should be best in slot. So we could try out the mobs a bit more. I know people tried Uldaman to get a really good axe to Ben. But it was to hard for them. Edit: We found out that the PLaguelands chests and Winterspring gives us the best armor and some of them is stuipd good. I know people have been getting 25 stamina on a head item. 2-handers with 16 Str and 16 Sta. I my self got a pair of maces that actully dosen't do that much damage. My maces have 9.0 Dps one of them got 20 attack power and the other one got 7 Agi 7 Sta. But i still do like 20-40 Damage which is not alot compared to what i need to do to take out mobs and other players. So as i said before you need to make like a custom gear, Standard and BIS so we know and could try with. So you scale the mobs after that. As the mobs are right now they are good i think level 50+ Mobs kills us easy. But we can kill level 20 mobs now and that i could not before. I know for a fact that Frederik and Ben (A really geared healer and DPS) did mange to solo pretty high level mobs yesterday. Does the difficulty of elites compared to normal mobs feel right? Sounds good that the scripting seems to work. I will definitely rework item scaling and have actually figured out how to do it for the random enchantments on green items. I have thought about giving you testers the command for adding items to yourself, to make it easier to test all the different gear there is. Maybe also the option to teleport or go to a specific creature. What do you think about that? Yea, those are some of the highest lvl gear with random enchantments you can get. It will look a lot different once I get the properly scaled. Good Stuff Mary. I love Gnomeregan. Just enter with a dedicated team and plenty of bagspace for all that loot.